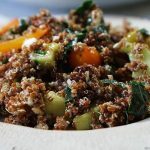 Kale and Quinoa Greek Salad - I love everything about this salad - the crunchy goodness, sweetness from the tomatoes, green peppers and the salad dressing and the saltiness from the feta cheese & kalamata olives. Measure one cup dry quinoa and cook according to package directions. When the quinoa is done, remove it from the stove and scoop it into a strainer to allow the excess liquid to drain. Transfer to a large bowl. Remove the ribs from the kale. Tightly roll the kale leaves and slice the kale into ribbons. Slice the cucumber in half lengthwise and remove the seeds by running a spoon down the middle. Chop the cucumber into bite sized pieces. Slice the cherry tomatoes, bell pepper & olives. Add these items and the pepperoncini peppers into the salad bowl. When the quinoa has cooled, add it and the crumbled feta cheese to the salad bowl and toss it with the Homemade Greek Vinaigrette Salad Dressing. This can be served at room temperature or chilled. It's also great the next day. Nutritional information based on 6 2 cup servings and includes Greek Vinaigrette Salad Dressing.